There’s a lot to love about the internet, really. But I think one of my favorite things is how it connects people, how it flattens old hierarchies (not really, but let me wax idealistic for the sake of this intro) and connects people. 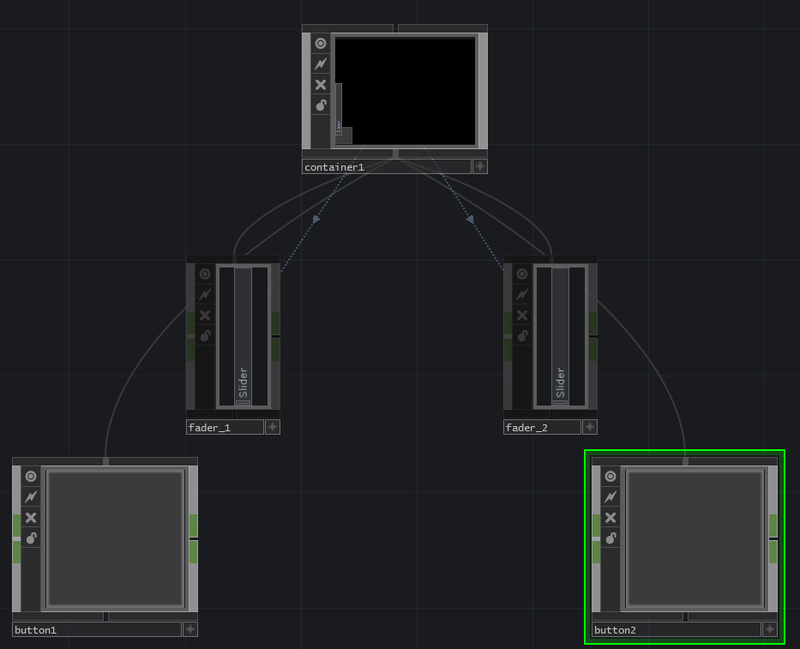 In starting to program with TouchDesigner, I did the thing that any smart n00b would do – I joined the forum. The TouchDesigner forum is a great place to ask questions, find answers, learn from some of the best, and to offer help. We’ve all been stuck on a problem, and a commons like this one is a great place to ask questions, and keep tabs on what others are doing. 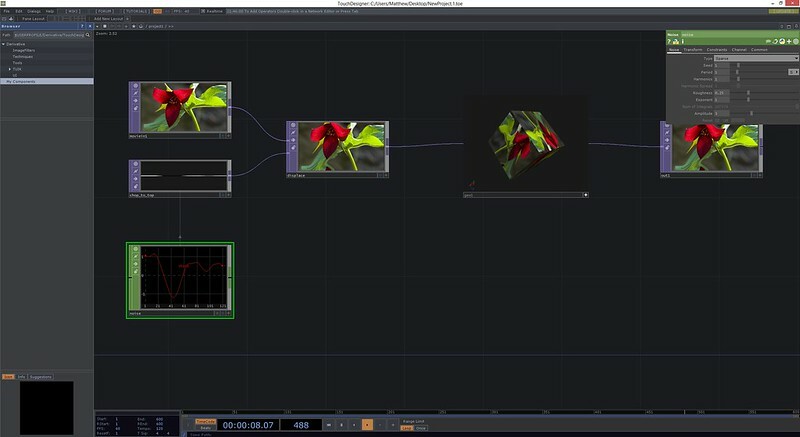 To that end I shared a technique for sending and receiving OSC data with TouchDesigner back in October of 2013. I also shared this on the forum, because this happened to be something that I figured that others might want to know more about. My post was a simple example, but often it’s the simple examples that help move towards complex projects. 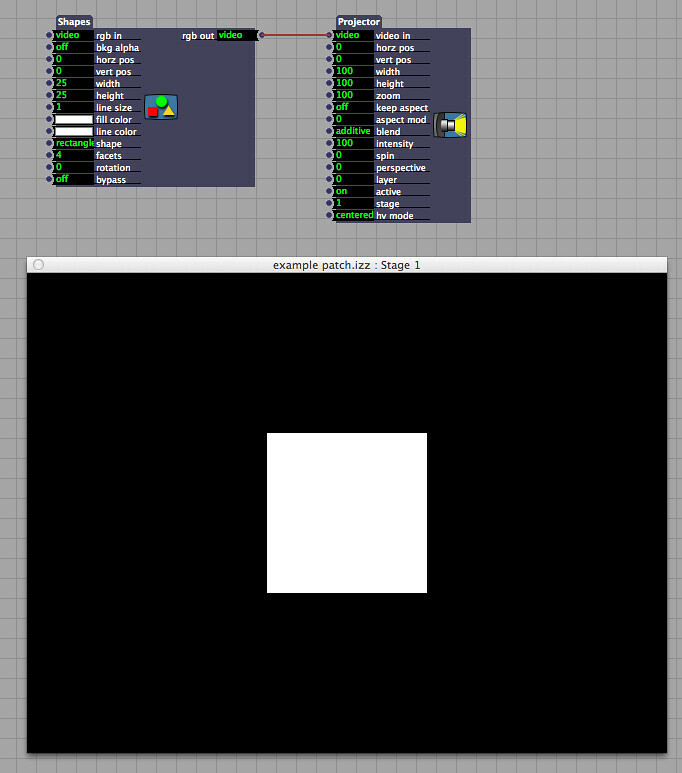 As it turns out, someone else was fighting the same battle, and had some questions about how to make some headway – specifically they wanted to look at how to create an interface that could be controlled remotely with TouchOSC or from the TouchDesigner control panel itself. 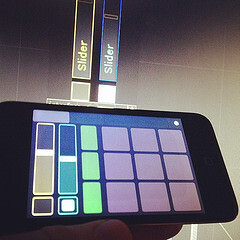 Ideally, each interface’s changes would be reflected in the other – changes on a smartphone would show up in the TouchDesigner control panel, and vice versa. I caught the first part of the exchange, and then I got swallowed by the theatre. First there was The Fall of the Hose of Escher, then Before You Ruin It took over my life, and then I spent almost a month solid in Wonder Dome. Long story short, I missed responding to a question, and finally made up for my bad Karma by responding, even if belatedly. It then occurred to me that I might as well write down the process of solving this problem. If you want to see the whole exchange you can read the thread here. Enough jibber-jabber, let’s start programming. For the sake of our sanity, I’m going to focus on just working with two sliders and two toggle buttons. The concepts we’ll cover here can then be applied to any other kind of TouchOSC widget, but let’s start small first. One more disclaimer, this one creates a messy network. If we took a little more time we could clean it up, but for now we’re going to let it be a little bit sloppy – as much as it pains me to do so. First things first, if you’re new to using TouchOSC you should take some time to get used to the basics and start by reading through this overview on using TouchOSC. Open Sound Control (OSC) messages are messages that are sent over a network. OSC can be used locally on a computer to allow for communication between programs, and it can also be used between multiple machines in order to allow them to communicate with one another. 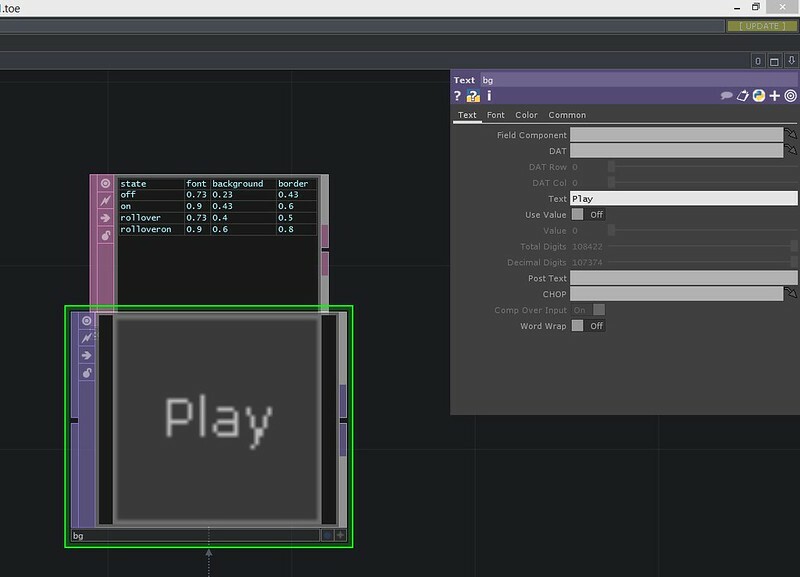 Interface tools like TouchOSC allow users to create custom interfaces that control some aspect of a program. That’s a very simplistic way of looking at OSC, but it’s a good start. The important takeaway here is that when we use OSC we’re actually relying on some network protocols to facilitate the communication between computers. 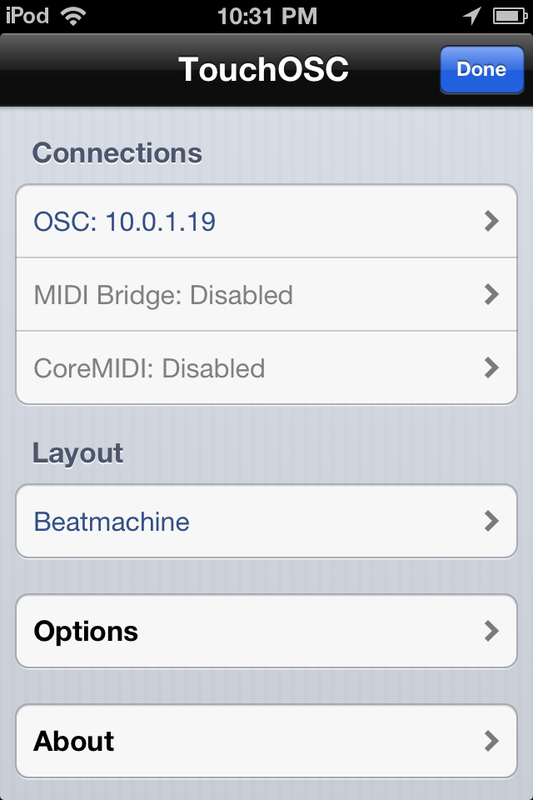 To get started I selected a simple interface on an iPod Touch that came with TouchOSC. 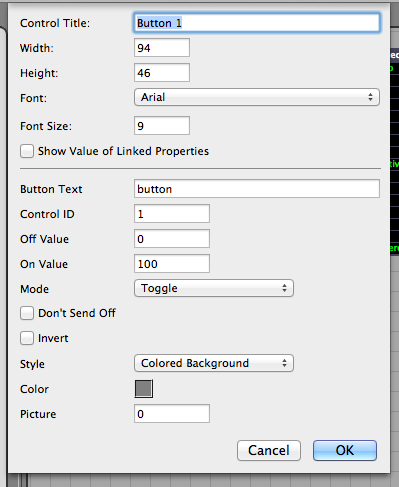 Again, I wanted something with two toggles and two sliders to serve as our example. We can set-up our mobile device by starting TouchOSC and hitting the circular option / configuration button in the corner. Once we do that we’ll see a screen with a few different options. We want to select the OSC connection tab. From here we need to configure a few settings. First off you’ll want to set add the IP address of your computer into the “Host” field. To find your computer’s IP address you can use the ipconfig command to quickly find your IP address (if this sounds like another language, check out this youTube video to see what I’m talking about). I also want to take note of the IP address of the device – this is the “Local IP address.” I also want to take a close look at the outgoing and incoming ports, I’ll need to use these numbers in TouchDesigner to make sure that I can talk and listen to this device. 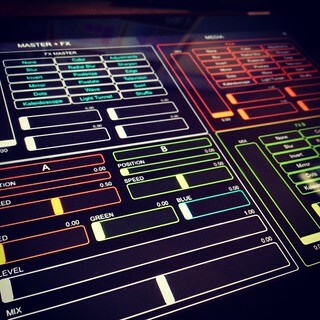 Alright, now that we know a few things about our mobile device now we can head back to TouchDesigner. First off, let’s take a look at how to listen to the incoming data. In a new network at an OSC In CHOP. In the parameters box let’s make sure that we’re listening to the same port that we’re broadcasting on – in my case it’s port 10000. Now you should be able to start hitting buttons and moving sliders to see some new channels appear in your CHOP. Here’s it’s important to take a closer look at the naming convention for our channels. Let’s look at 1/fader1 first. 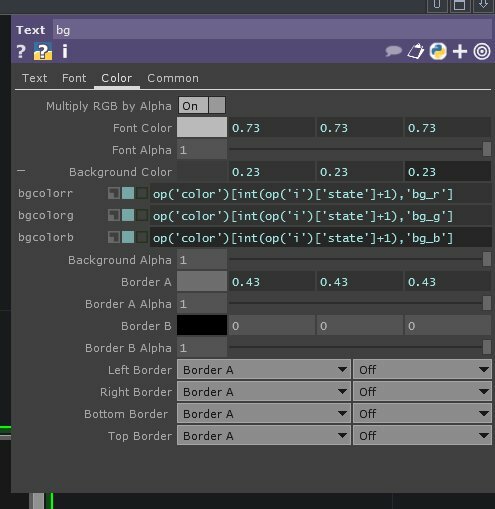 TouchOSC has a great utility for creating your layouts, and if you let it do the naming for you this is the kind of format that you’ll see. The semantics of this are page/widgetNameWidgetNumber. So by looking at 1/fader1 we can read this to mean that this is on page one, it’s a fader, and it’s number (the order it was created) is one. This naming convention is going to be important to take note of, and will save you a lot of headaches if you take some time to really wrap your head around how these widgets are named. Before we start building an interface to control let’s take a moment to get a few more ducks in a row. 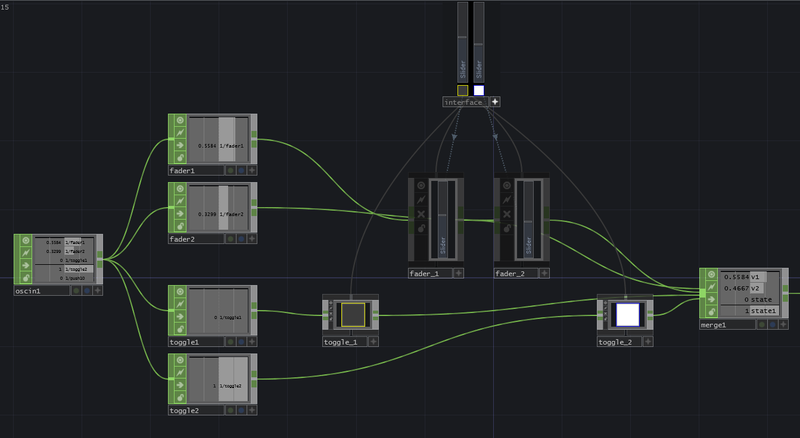 I’m going to connect my OSC In CHOP to four different select CHOPS – each control is going to be routed to a button or slider, and I want to make sure that I’m only dealing with one channel to do this. For my own sanity I’ve named each of the selects with a name that corresponds to what channel they’re carrying. You can choose any naming convention that you’d like, but definitely choose a naming convention. This kind of patching can get messy quickly, and a solid method for naming your operators will server you well. Before we move on let’s take a closer look at one of the selects to see how we can pull out a particular channel. You’ll notice that in the Channel Names I’ve used the name *fader1 rather than 1/fader1. What gives?! Either of those names is going to give me the same result in this case. I’ve elected to use the asterisk modifier to save myself some time and because I’m only using page one of this particular interface. What does the asterisk modifier do? I’m so glad you asked – this particular modifier will give results that match anything after the asterisk. If, for example, I had 1/fader1, 2/fader1, and 3/toggle1 as incoming channels, the asterisk would pull out the 1/fader1 and 2/fader1 channels. Naming and patterning isn’t important for this particular example, but it’s a technique to keep your back pocket for a rainy day. I’m also going to add two Button COMPs and a Container COMP to my network. Before we move forward, I need to make a few quick changes to by buttons. You’ll notice that the sliders both have CHOP inlets on their left-hand side, but my buttons do not. This means that my sliders are all ready set-up to receive a channel stream to change them. My buttons aren’t ready yet, so let’s take a look at the changes we need to make. Let’s start by diving into our button. Here I’ve added an In CHOP that feeds to a Math CHOP that I’ve renamed to “i” that’s finally connected to our Out CHOP. So why a Math, and why rename it? If you look closely at the Text TOP you’ll see that it’s driven by several expressions allowing it to change color based on its active state – this is part of what’s happening in the expression CHOP originally called “i”. Here our Math CHOP is set to add our in and the “ii” CHOP (formerly just “i”) together. By changing the name of the operators, I’ve avoided re-writing the scripts to save myself some time. If you’re still with me, this is where the real magic starts to happen. 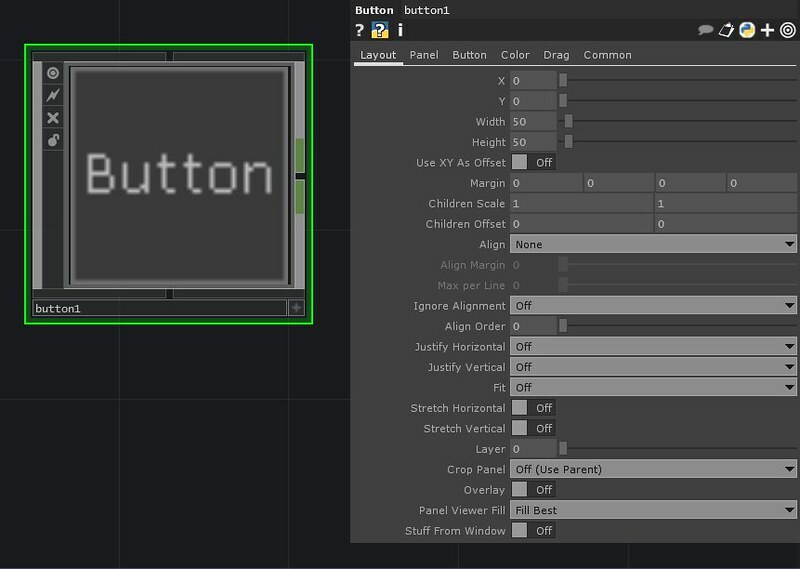 First up we’re going to connect the our corresponding OSC In values to our control panel elements that we want to control. Fader 1 to fader 1, toggle 1 to toggle 1 and so on. Next we’re going to connect all four of our control panel elements to a single Merge CHOP. Whew! Alright gang, at this point you should be ready to start making the magic happen. 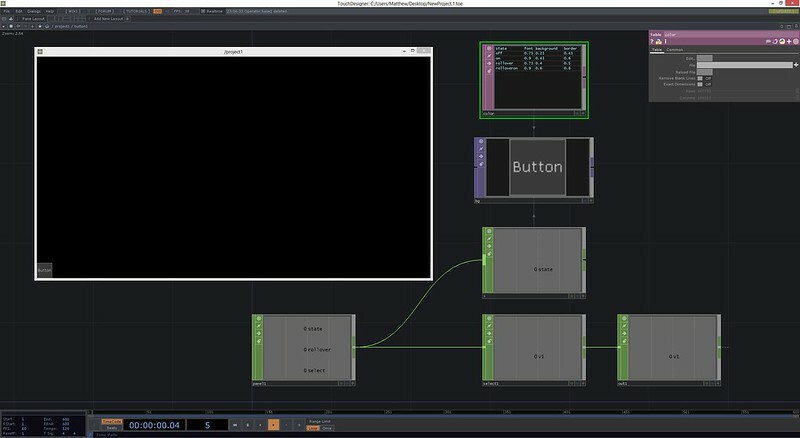 If you’ve got everything set-up correctly you should now be able to drive your control panel in TouchDesigner either from the panel we created, or from a TouchOSC setup. As a bonus (why we did all of this hard work) you should also be able to see your changes in either environment reflected in the other. This entry was posted in How-To, Live Performance, Programming, TouchDesigner and tagged Arizona, Arizona State University, Derivative, Grad School, graduate school, Live Performance, media design, programming, show control, TouchDesigner, TouchDesigner Tutorial, TouchOSC on April 11, 2014 by raganmd. Building any system that requires an operator who isn’t the system designer often involves creating a control panel to operate the patch or network in question. A control panel can also be useful for controlling various elements of a system that might otherwise be too complicated to manipulate directly. In TouchDesigner one of the handy built in components that you might think about using is a button. Buttons have various states of operation that offer different types of control. 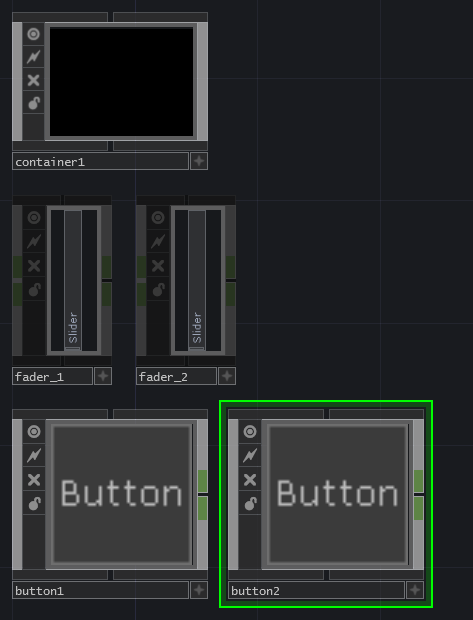 Let’s star this process by looking at some actual buttons in TouchDesigner so we can see some how these work in practice. Lets start by creating a new network, and deleting the template operators – if you’re new to touch you can draw a rectangular selection by clicking and dragging with the right mouse button. Select all off the operators and hit delete or backspace. 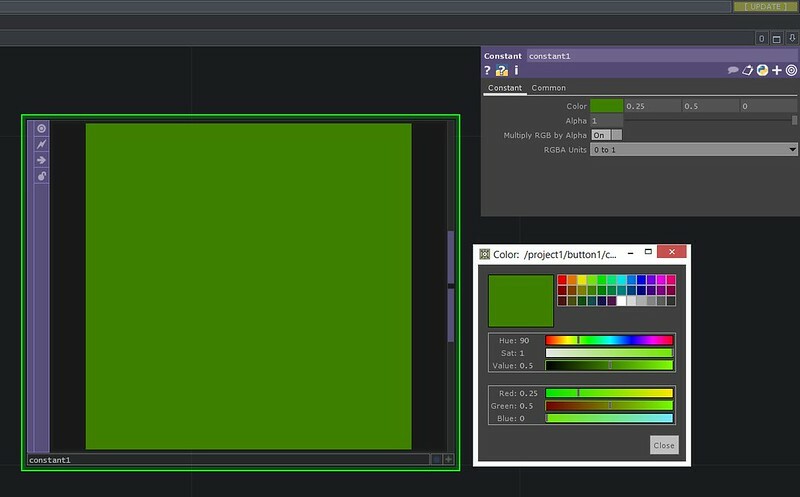 You can also close your palette browser. You should now be left with an empty network. To get started we’re going to double click the empty network or hit TAB on your keyboard. This brings up the Operator Dialog window. Make sure that you’re in the COMP (component) tab of the dialog window, and select a “Button” from the “Panels” column. Place this button anywhere on your network. If we look at the parameters of this component we can start to get a sense of how it works, and how we can customize its operation for whatever you might be designing. The Layout page gives us the ability to manipulate how the button is placed and represented on the control panel itself. The Panel page gives us some control over how the button behaves in the panel. The Button page allows for manipulating the kind of button operation methods. The Color page allows for some alteration in the color of the button. The Drag page controls the drag and drop behavior of the button. The Common page controls for some of the higher order mechanisms for this component – for now we don’t need to worry about this page. To learn more about the Button COMP make sure that you look at Derivative’s documentation here. Before we move on, let’s open up our control panel so we can see what our button looks like, and where it’s situated. In the upper left hand corner of your network there’s a small square shaped button. Mousing over this button will reveal the help text “open viewer.” Clicking on this button will bring up the panel viewer for the container that you’re working inside of. At this point you should be able to click on your button in the viewer. To help us understand what’s happening with the button itself let’s attach a Null to the CHOP out from the container. In your network add a Null Chanel Operator (CHOP). Attach this to the CHOP out from the button (you can tell that it’s a Chanel Operator Out because of the color). With the null attached, now when we click on our button in the viewer we can see what kind of signal is being generated by this button component. Before we take a closer look at button modes, let’s first see how we can position our button in the viewer. First select the button component to bring up the parameters window. Here on the Layout page we can see X and Y as variables that we can manipulate. These allow us to change the position of the button. The values for X and Y are in pixels. For now, I’m going to leave my button in the bottom left corner. Next lets take a look at the Button page for this component. Two of the most commonly used states for buttons are Momentary and Toggle. Momentary transmits a signal as a pulse. Clicking the button sends an on, releasing the button sends an off. A toggle enables a button state to be activated or deactivated. In this case, clicking the button toggles it to the on position where it stays until you click the button again sending a signal of off. There are additional button types to choose from, but for now these two different types will help us enough to work through some basic ideas about how you might use and change a button. I’m going to leave my button set as a toggle down for now. 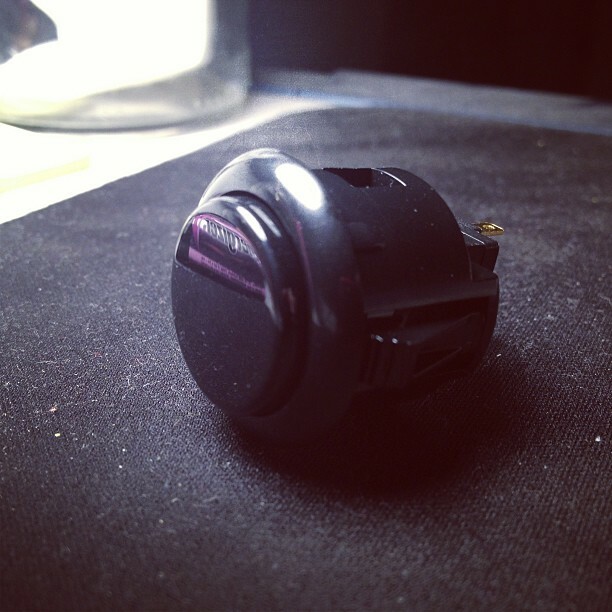 Now that we have a basic understanding of how this component works, lets start customizing it’s appearance. To do this we need to dive inside of our Button. We can do this by zooming in with the scroll wheel until we dive into the component, or we can select the button and hit the “i” key on your keyboard (i in this case is a shortcut for “in”). Inside of our button we can see the Chanel operators, Texture Operator, and Data Operator that are driving this interface element. One of the most interesting elements to take a note of us the panel1 CHOP. 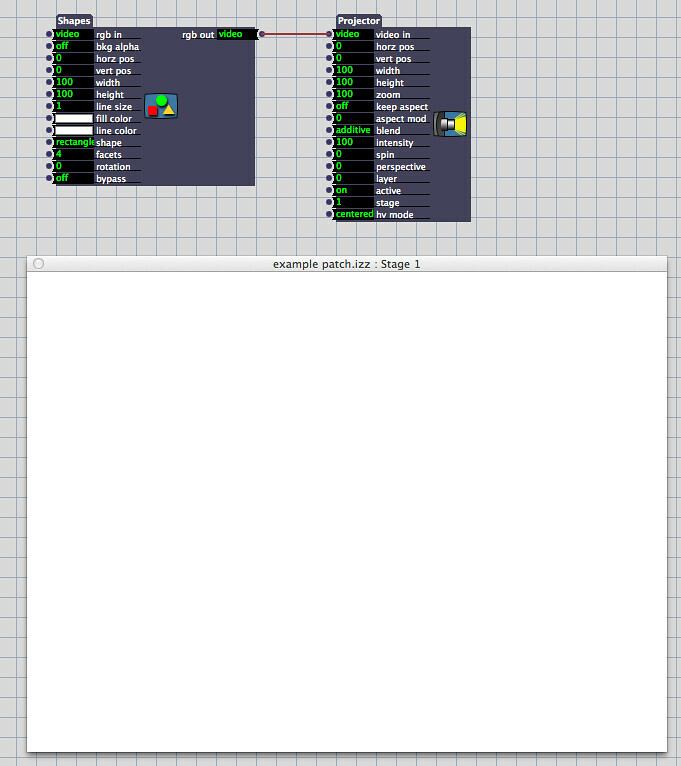 Here you can see that TouchDesigner tracks several different kinds of interaction for our button. We can trigger actions based on the state of our button (is it on or off), the rollover position of our mouse (is the mouse hovering over the button), and if the button is being actively selected (the moment when the mouse button is being actively clicked). Next I want to adjust the color of this button. Before we do that, lets first draw our attention to the fact that our button changes it’s color depending on if we’re mousing over it, or have turned it on or off. A closer look at the Text TOP and the associated DAT and CHOP we can see that something very specific is happening. 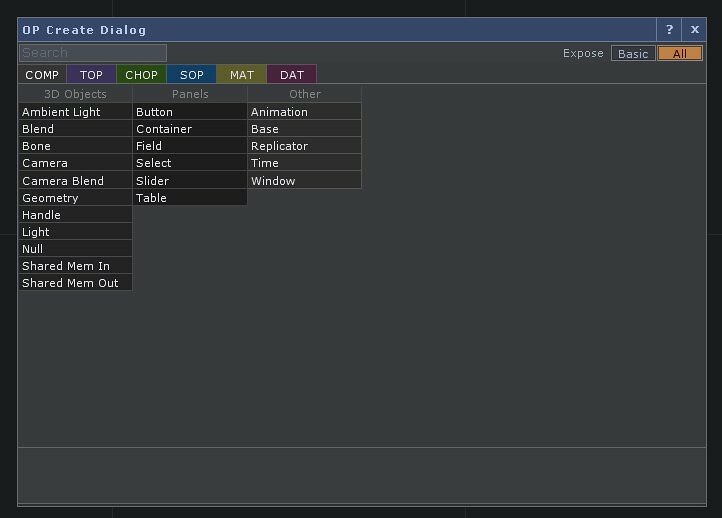 An expression CHOP is watching the button and reporting out the state of our button as a variable called “i” which is then being used by the DAT to dynamically change the color of our button. The table DAT defines what color values should be used for the button in the states: off, on, rollover, rollover on. 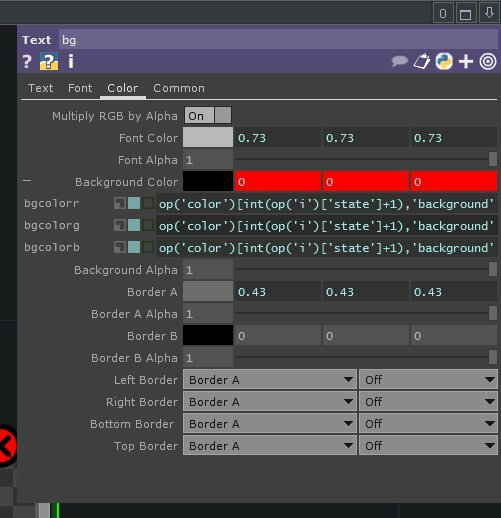 If we want to keep the established convention of different colors for different states, we then need to edit the table DAT rather than the text TOP. Let’s start by zooming into the table DAT. We can see here that we’re only using a single color value here for the dynamic content. This means that our options for changing the color of the button right now are only limited to gray scale. Bummer. Let’s make some changes to our table so we can have some color. To do this we’re first going to make our DAT active by clicking on the small + sign in the button right corner of this operator. Next lets fix our text TOP. Click on the Text TOP and then click on the Color page. On this page we can see that our values for the background color are all 0s and in red, telling us that something is broken. If we click on the text “Background Color” on this page we can see the expressions driving the dynamic changes for this TOP. We’ll do that by changing the term “background” in the expressions to match the columns that we’ve added. Now we need to change our table DAT in order to generate the colors that we want for our button. To help me determine the float values for the colors that I want, I’m going to add a constant TOP to the network momentarily. With my constant added to the network, I’m click on the white rectangle to bring up the color selector. 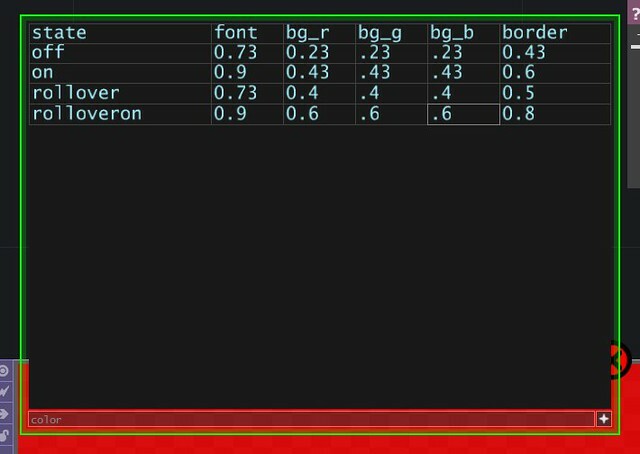 This window will also give me the float values that I want to know so I can edit my table. We now have a Button that we’ve given a unique name to, and made changes to a table DAT so that we can see a custom set of colors on our button that dynamically change as we operate our control panel. Now that we’ve made one, try making some buttons on your own. This entry was posted in Design, How-To, Live Performance, media design, Programming, TouchDesigner and tagged Arizona, ASU, buttons, Control, Grad School, graduate school, show control, TouchDesigner, TouchDesigner Tutorial on November 2, 2013 by raganmd. 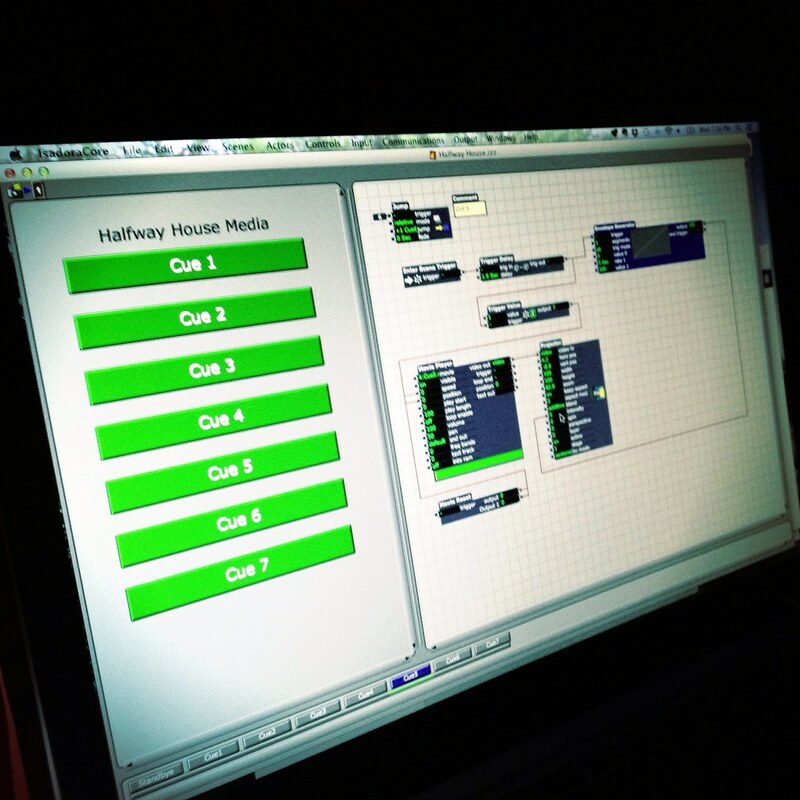 Sometime last year (in 2012) I came across Graham Thorne’s instructional videos about how to transmit data from Isadora to Touch OSC. Here’s Part 1 and Part 2 – if this is something that interests you, I’d highly recommend by that you watch these two videos first. While I didn’t have a TouchOSC project at the time that I was working on, it got me thinking about how interfaces communicate information about what’s happening in a patch, and how that information communicates to the operator or user of a given system. This year I’m working on the thesis project of Daniel Fine (an MFA student here at ASU), and one of the many challenges we’re bound to face is how to visualize and interact with a system that’s spread across multiple computers, operating systems, and controlling a variety of different systems in the installation / performance space. To that end, I thought that it would be important to start thinking about how to to send control data to a TouchOSC interface, and how to then ensure that we can see relationships between different control values in a given control panel. That all sounds well and good, but it’s awfully vague. A concrete exploration of this kind of concept was what I needed to start planning, in order to more fully wrap my head around how idea could be more fully exploited in a performance setting. 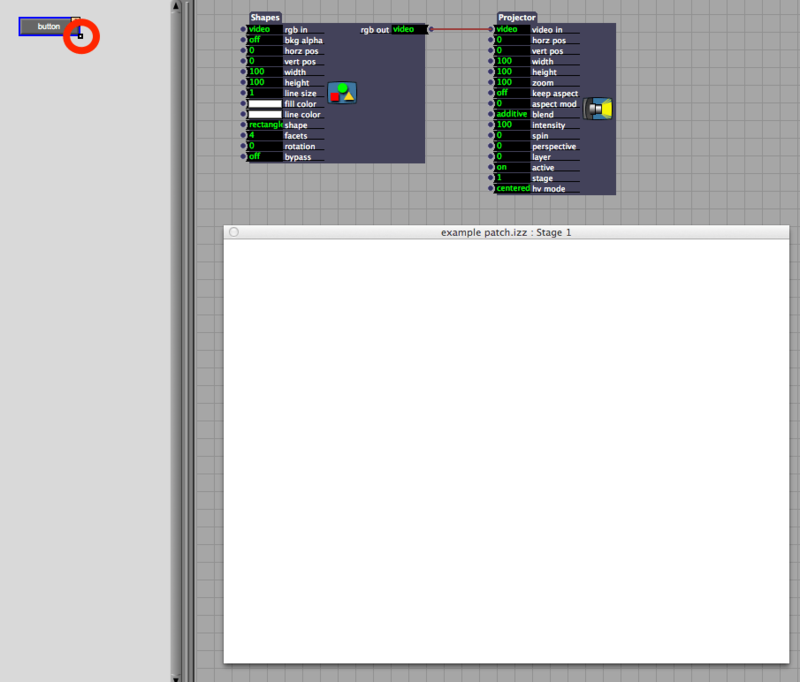 In order to do this I decided that I wanted to accomplish a simple task with a TouchOSC control panel. 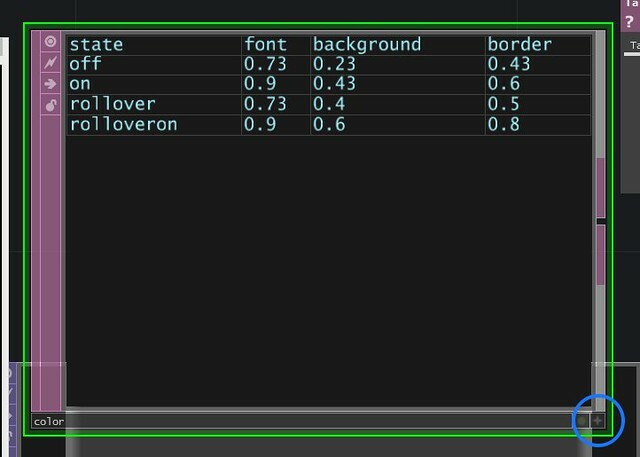 On a simple panel layout I wanted the position of Slider 1 to inversely change the position of Slider 2, and vise versa. In this way, moving Slider 1 up moves Slider 2 down, and moving Slider 2 up moves Slider 1 down. In performance setting it’s unlikely that I’d need something this simple, but for the sake of testing an idea this seemed like it would give me the kind of information that I might need. 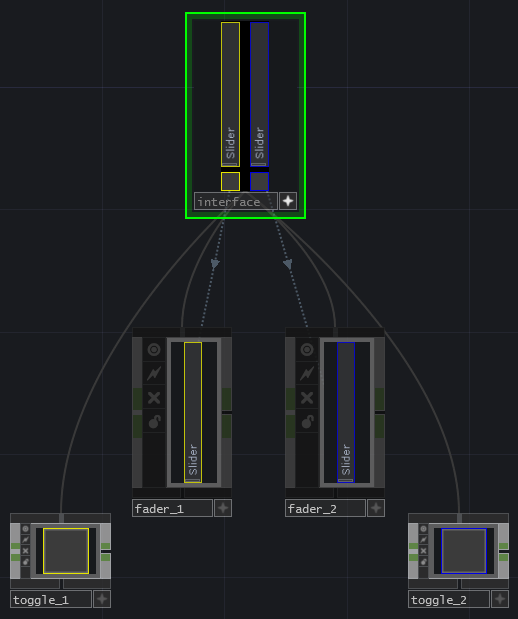 Once you have your connections between TouchOSC and Isadora set up you’ll want to make sure that you’ve isolated a single slider. We can do this by using the OSC Lister Actor. 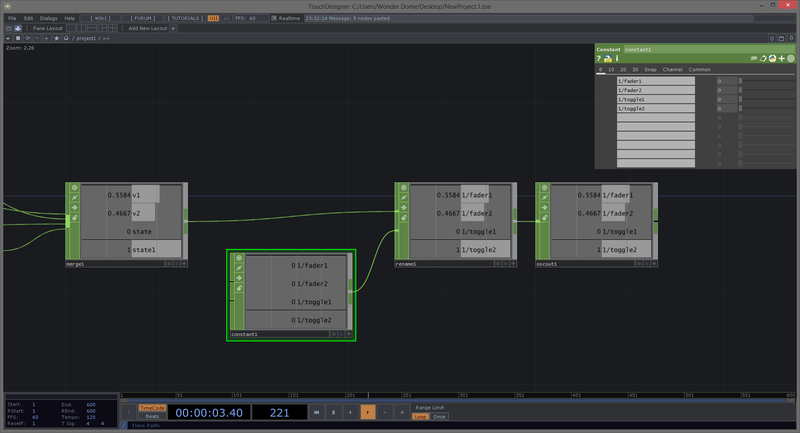 The OSC Listener reports the data coming from a given channel that you specific in the input inlet on the actor. The listener then sends out the transmitted values from the value outlet. UDP Addr – UDP address. This is the IP address of the computer or device that you’re taking to. You can determine what this address is in TouchOSC by looking at the info panel. Imagine that this is the street name for a house that you’re sending a letter to. Port – this is the port on the device that you’re sending data to. It’s important that you know what port you’re trying to talk to on a given device so that your message can be parsed. If the UDP Address is the street name, the port number is akin to the house number that you’re trying to send a letter to. Address – The address in the case of TouchOSC is the individual target / name of an asset that you want to change. 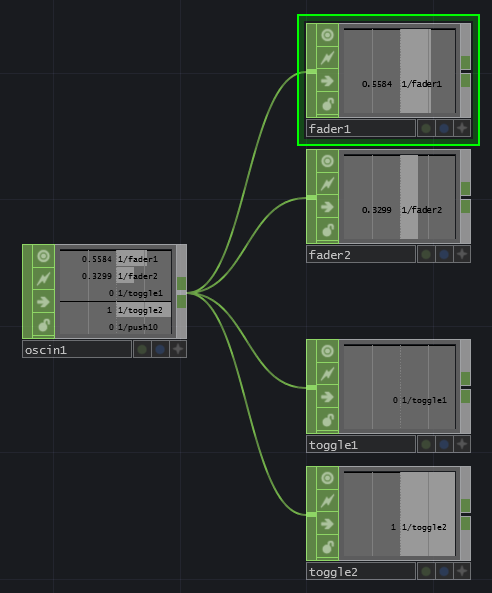 Each of the sliders and buttons on a TouchOSC panel have a name (for example – /1/fader1), the address is how you tell Isadora what slider you are wanting to change. You can determine these names by looking closely at your Stream Set-up when you’re connecting your device to Isadora. To follow with our letter sending metaphor above, the Address is the name of the person you’re sending the letter to. Use Type – this allows us to toggle the sending mechanism on and off. Value – this is the value that we’re transmitting to our other device. To use the OSC Transmit actor we need to fill in all of the appropriate fields with the information from our mobile device. You’ll need to specify the UPD Address, the Port number, the Address, and connect the value out form our Scale-Value actor to the value inlet of the OSC Transmit Actor. 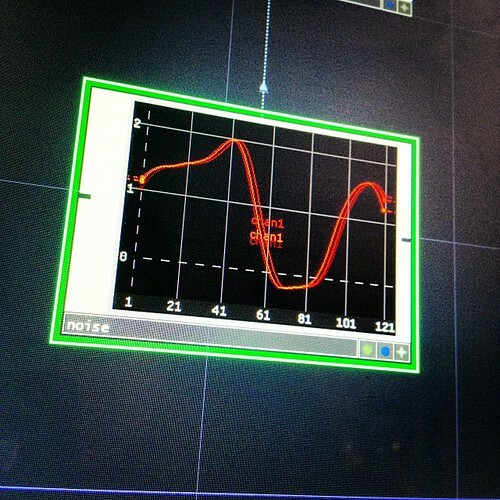 In this test I started by having fader1 drive fader2. Once I got this working, I then repeated all of the steps above, for the other fader – if you look closely at the full patch this will make more sense. The resulting interaction can be seen in the gifs below. This entry was posted in How-To, Isadora, Live Performance, media design, Programming, Uncategorized and tagged Isadora, media design, programming, show control, TouchOSC on October 9, 2013 by raganmd. 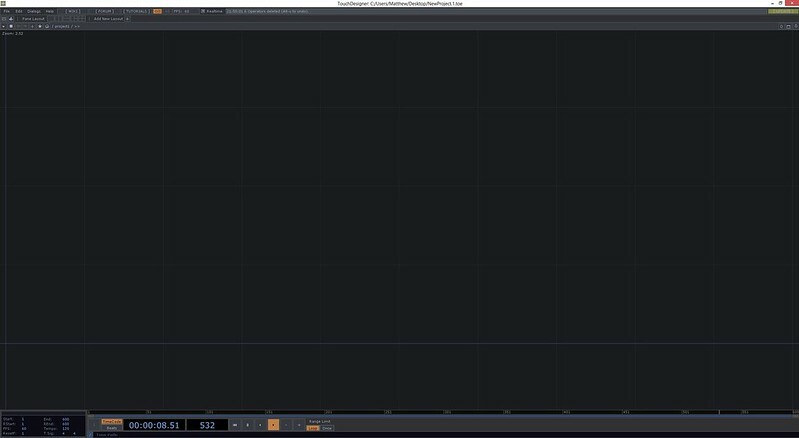 In a previous post I talked about how to get started in Isadora with some basics about slider operation. I also want to cover a little bit about using buttons with Izzy. Buttons are very handy interface controls. Before we get started, it’s important to cover a few considerations about how buttons work. When working with a physical button, like an arcade button on a midi controller, the action of pressing the button completes a circuit. When you release the button, you also break the circuit. 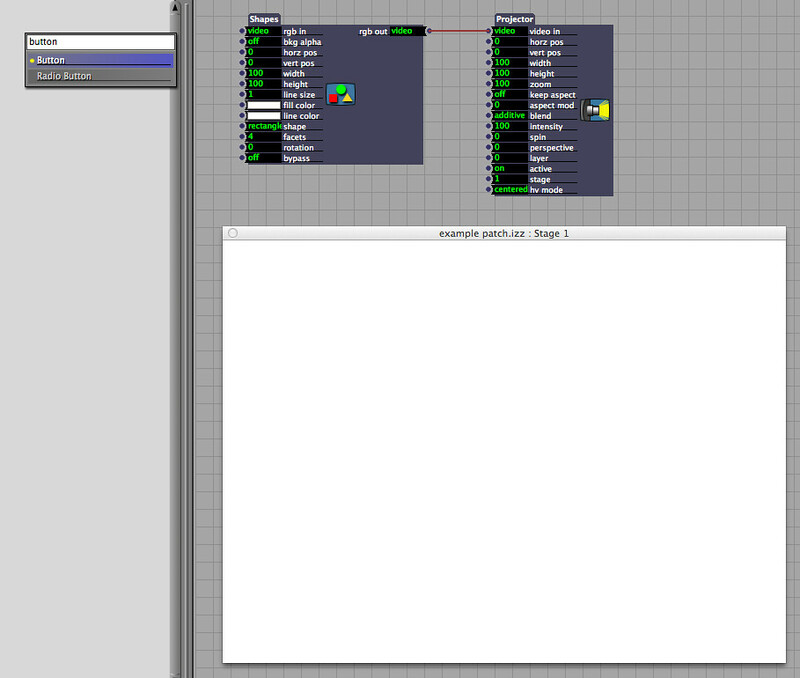 In Isadora, we can control what happens when we press a button. Specifically, we can control what values are being transmitted when the button isn’t being pressed, when it is being pressed, and how the behaves (does it toggle, or is the signal momentary). Thinking about how a button behaves will help as you start to build an interface, simple or complex. Let’s start by experimenting with a simple implementation of this process. We’ll create a white rectangle that fills our stage, connect our shape to a projector, and finally use a button to control the intensity of the projector. Start by creating a new scene, and adding a “Shapes” actor and a “Projector” actor. Connect the shapes’ video outlet to the projector’s video inlet. Next change the width and height dimensions of the shape to be 100 and 100 respectively. 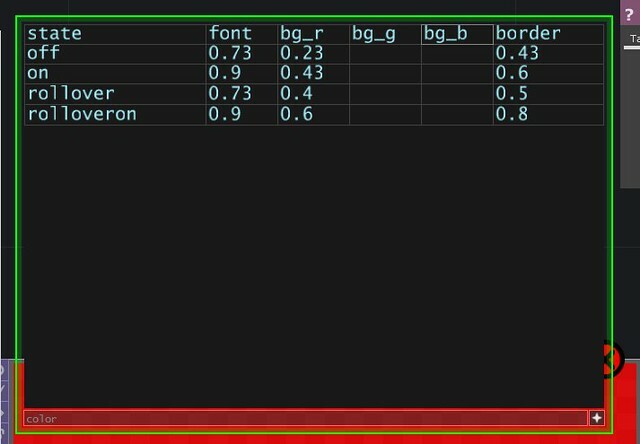 Remember that Isadora doesn’t use pixel values, but instead works in terms percentage. In this case a value of 100 for the hight indicates that the shape should be 100% of the stage’s height, the same applies for the width value of 100. We should now have a white box that covers the height and width of the stage so that we only see white. Now we’ll use a button to control a change in the stage from white to black. Remember that in order to start adding control elements we first need to reveal the control panel. You can do this by: selecting it from the drop down menu use Command-Shift-C to see only the control panel or use Control-Shift-S to see a split of the control panel and the programming space. 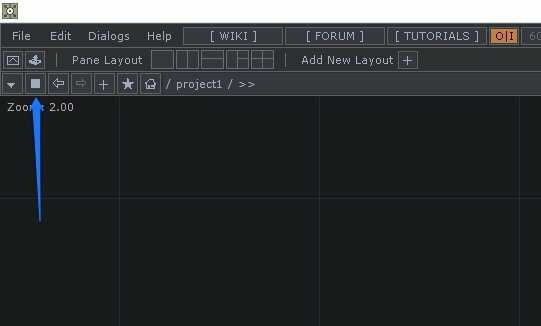 If you’ve turned on the Grid for your programming space you’ll be able to see a distinct difference between the control panel space (on the left) and the programming space (on the right). You’ll also notice that with your Control panel active your actor selection bins have been replaced by control panel operators. With the control panel visible, add a button. 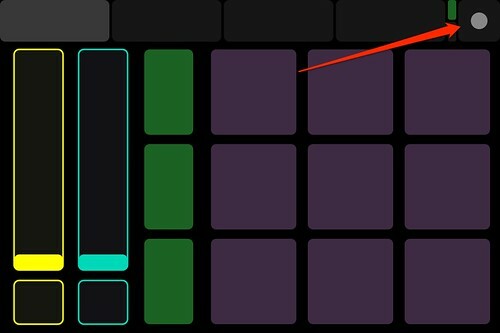 Once you’ve added your button to the control panel, you can change the size of the button by clicking and dragging the small white square on the bottom right of the button. Mode (Momentary or Toggle) – the mode for the button. Momentary indicates that the on value is only transmitted while the button is being pressed. Toggle indicates that the values with toggle between on and off values with a click. There are a few other options here, but they mostly have to deal with the appearance of the button. When you start thinking about how you want your control panel to look to an operator, these last parameters will be very helpful. We can disable edit mode by right clicking on the control panel work space and selecting “Disable Edit Mode” from the contextual menu. We can use the option key to by-pass the above process. If you’re doing some extensive testing of your control panel I’d recommend that you disable edit mode. On the other hand, if you’re only testing a single slider or button, I’d recommend using the option key as a much more efficient alternative. 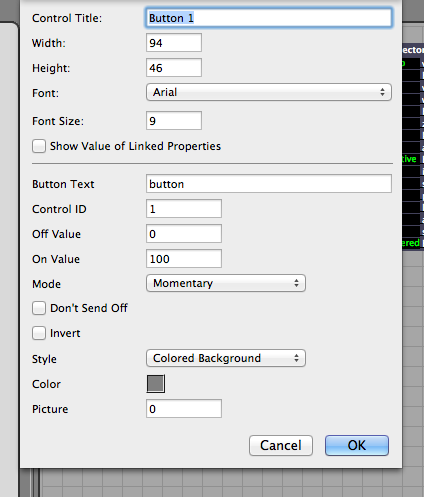 Holding down the option key, you should now be able to click the button in the control panel. You should see the white box flash on, and back off again as you press and release the mouse button. Right now as we click the button we’re sending a value of 100 to the intensity parameter of the Projector actor. This makes the shape opaque only so long as you’re pressing the button. Double click the button in the control panel and check the box for “Invert.” We’ve now inverted the message being sent from the bottom to the Projector. When you click the button you should now see the opposite. A white screen that flashes black, and then returns to white. 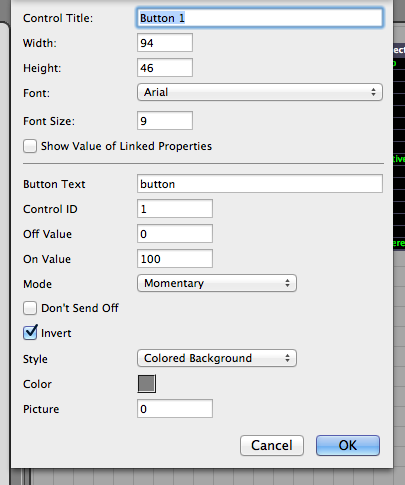 Double click on the button in the control panel, uncheck the box for “Invert.” Change the “Mode” of the button from “Momentary” to “Toggle.” Now as you click the button you should notice that it stays depressed until you click it again. This allows you to toggle between the on and off states of the button. This, obviously, is only the beginning of how to work with Buttons. You might use a button to control the play back of a movie, what media was on the stage, the position of media on a stage, to jump between scenes, or to change any number of parameters in you parch. Knowing the basics of how buttons behave will help ensure that you can start to build a solid control panel that you can use during a live performance. This entry was posted in How-To, Isadora and tagged Arizona State University, ASU, graduate school, Isadora, media design, programming, show control on May 20, 2013 by raganmd.